Reidler Decal Corporation—The Reidler Decal Corporation started in the sign business in 1926 hand-lettering show cards, windows and trucks. Since then we have grown to become one of America's largest graphics manufacturers. Our specialized equipment and large inventory of materials are now available to you so that, together, we can partner to increase both of our sales for the future. Vehicles that have to work in fog, rain, snow or at night NEED 3M reflectorization. 3M reflectivity is created by using either prisms or tiny encapsulated lenses. The printed graphics will have up to 100 candlepower reflectivity even at angles up to 90 degrees. HINT: The more reflectivity you put on your emergency vehicles the better it can be seen in conditions of poor visibility. Many ambulances now even have their roofs reflectorized so that they can be identified from helicopters. 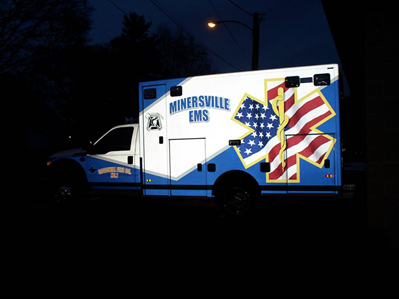 Note: The photo of the ambulance showing the power of reflectivity was taken at night, in January, in the middle of an ice storm! © 2019 REIDLER DECAL CORPORATION. SITE DESIGN & DEVELOPMENT BY TRISCARI.